Dr. Anthony Fauci, director of the National Institute of Allergy and Infectious Diseases, said "all options are being looked at." The question, Fauci told CNN, is whether "the extra level of screening is going to be worth the resources you need to put into it." 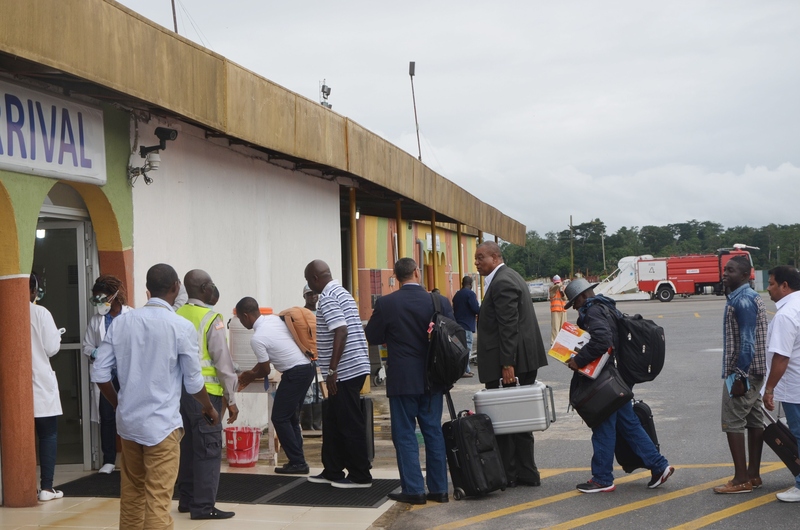 "There is clear-cut screening going on in the exit end," Fauci said, referring to the screening of outbound passengers before they leave Ebola-affected countries. The current U.S. discussion, he said, centers on "what kind of screening you do on the entry end. That's something that's on the table now." Officials are seeking a balance between "the benefit of doing that and resources required," Fauci told The Associated Press on Monday. "Everyone is being screened when they leave the country. In fact, we know the patient in Dallas's temperature was 97.3 when he left Monrovia," Dr. Tom Frieden of the Centers for Disease Control and Prevention told "CBS This Morning," referring to a Liberian man, Thomas Eric Duncan, who started showing symptoms of Ebola after arriving for a visit in the U.S. Duncan is now in critical condition at a Dallas hospital. Since the outbreak began, Frieden said, "about 40,000 people have come in from those countries [in West Africa]. None of them had fever from Ebola when they came in. But we will look at at all opportunities to improve the safety of Americans because that is what the CDC does 24-7. " Five Americans who developed Ebola while in West Africa have returned to the United States for treatment since the start of the latest Ebola outbreak, which the World Health Organization estimates has killed more than 3,400 people. The Obama administration has said that it won't shut down flights from affected countries, particularly those in West Africa. Fauci reiterated that such a travel ban could end up spreading the epidemic in those countries by making it harder to get aid in, for instance, and further isolating the patients from treatment. Regarding the White House meeting, Frieden told "CBS This Morning," "We're going to be covering many aspects and figure out what we can do" to protect Americans and stop the outbreak. He added that he was encouraged by ongoing vaccine trials. Fauci noted that the supply of the experimental drug known as ZMapp, which may have helped two American health workers who caught Ebola while working in Liberia, is gone. He said federal officials were helping the drug manufacturer with efforts to boost manufacturing, but that it would be up to two months before any more of the drug is available. Moreover, tests on potential vaccines or treatment drugs need to be done to prove that a drug works. Frieden said he doesn't believe the disease is going to spread widely in the United States. "We can stop it in its tracks here, which we are doing," he said. The Ebola has taken the biggest toll in Liberia. There aren't enough beds in isolation units to keep up with the hundreds who get sick each week. The U.S. military is beginning work in the Liberian capital, Monrovia, on the main structure of a 25-bed clinic that will treat health care workers infected with Ebola. The U.S. has also promised to build 17 other Ebola treatment centers, which would have space for 100 patients each.